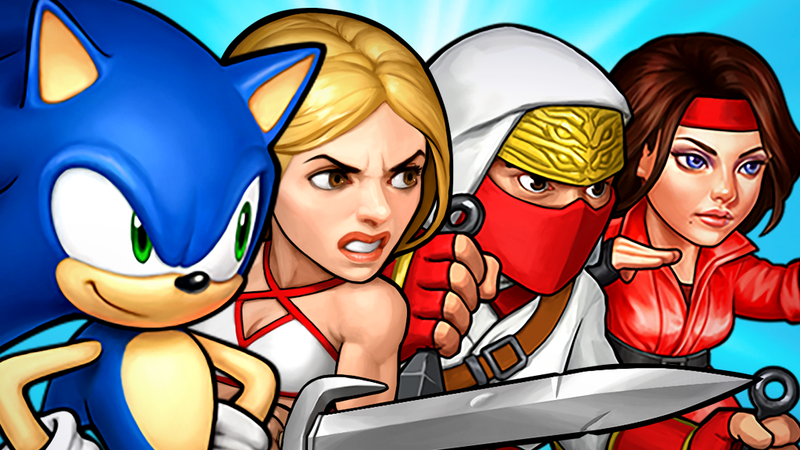 Defeat evil with a dream team of Sega characters in this mobile puzzle game. Sega Heroes is a free-to-play mobile game that lets players collect characters from multiple Sega games and take them into match-three battles. Players start with only two characters on their team -- Amy from the Sonic The Hedgehog series and Ax Battler from Golden Axe -- but they can collect additional heroes over time. So far, the game lets players collect heroes from Sonic The Hedgehog, Golden Axe, Shinobi, Streets of Rage, Super Monkey Ball, Jet Set Radio, and Phantasy Star. Additional characters will be added to the game going forward. Users can take a team of up to four heroes into each level-based battle, so players can mix and match their favorite heroes to create the ultimate team based on each character’s abilities. During battles, players need to swap the locations of touching gems to create matches of three-or-more gems of the same color. If you’ve played Candy Crush Saga or any number of popular match-three games, the gameplay here is similar. Each time players make a match, the hero with the corresponding color will attack one or more enemies at the top of the screen. Players need to defeat every enemy before their own characters are taken out. In between stages, players can spend the currency they collect while playing to level-up their heroes and make them stronger. Users can also complete quests, or special missions that reward them with in-game prizes. Finally, players can participate in in-game events. A multiplayer guild system will be added to the game in the future. Sega Heroes is available to download for free on iOS and Android devices. The game is rated E for Everyone on Android and 9+ on iOS. Sega Heroes contains optional in-app purchases. Check out the first 10 minutes of Sega Heroes in our SuperParent First Look below to see if your kids would enjoy this game.